*The company reserves the right to introduce / revise the fuel surcharge from time to time without prior notice. At time of print fuel surcharge on excursion is €5.00 each way (not applicable to infants). 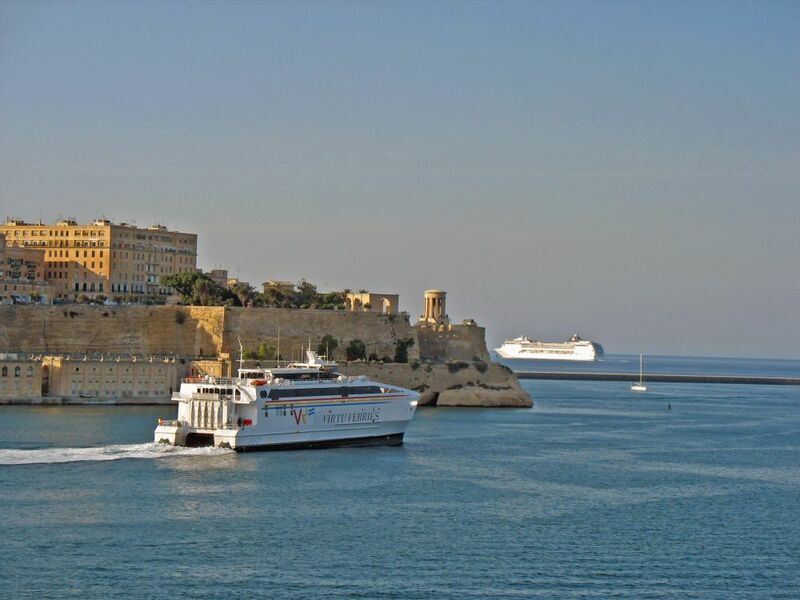 Local Transport Malta (Hotel/Harbour/Hotel) only €12.50 extra (per person). VAT included. Sicily is a country of diversity, you cannot do it justice in a short spell of time. It is easy to forget that the Island, population of 5 million, only became part of the Italian state in 1860. We suggest you look out for the ever changing landscape, a feature even on a short trip and it is not every day that you will visit a volcano, Etna; the characteristic hill-top towns rebuilt after the devastating earthquake of 1693 and the affluence of picturesque Taormina. If your stay is for a few days, do not forget Sicily was once Magna Grecia; the Greek Temples of Agrigento are a unique experience as are the Roman Mosaics at Piazza Armerina. The archaeological sites of Siracusa include the Greek and Roman Theatres and the Cathedral, a former Temple of Athena in the ancient City of Ortegia. The baroque cities of Noto, Ragusa and Modica are minutes away from Pozzallo. Palermo, the capital is a treasure trove; Erice and Cefalu are within easy reach. Shopping in Catania is an experience. Mt. Etna: The largest and most active volcano in Europe. The climb to the crater takes us through picturesque villages and an ever changing landscape. The lower slopes of the volcano are extremely fertile with groves of oranges, lemons and other Mediterranean flora and of course vines which produce Sicily’s best wines. We go through forests of chestnut trees which gradually give way to oak, beech, birch and pine. Modica: This proud, prosperous and ancient city is one of Sicily’s baroque gems. The main street ‘Il Corso’, is a typical Italian meeting place with cafés and majestic buildings. The church of San Giorgio is an impressive monument, built after the earthquake of 1693, surrounded by a flight of 250 steps to further enhance the scenic beauty of its fine facade. Drive up to Sylvester Craters of MT. ETNA having time for lunch (not included in the price) and souvenir shopping. Above fares include charges, except fuel surcharge.